Sometimes it is useful to edit multiple work items at once. For example when you want to set the area or iteration for a group of work items, or if you want to set a value in another field. Visual Studio does not allow you to do this, besides editing work items and save them all at once. However, there are 2 ways in which you can easily edit multiple work items in TFS at the same time. I will describe them both. 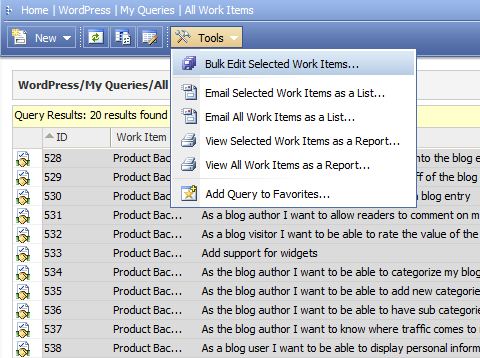 Fill in your filters and save the query in the My Queries or Team Queries folder. 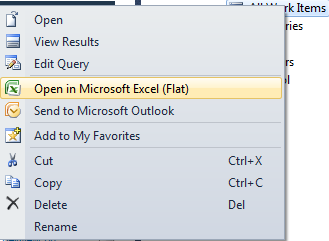 For bulk edit Excel is really good, and a lot of people already know this. Less popular but effective as well is using the Web Access Client for Bulk Edit. Can this be updated to show how this would work in TFS 2012? Thanks for the feedback ! I will try to write this up soon ! I just wrote part 10 of the hidden gems series where I talk about the feature in 2012! Thanks! Thanks much you saved me hours of useless clicking! 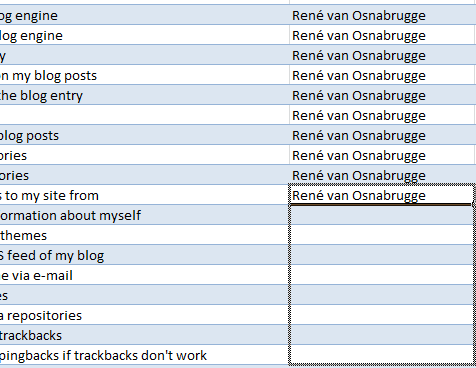 What about bulk editing test steps? You can use the grid view on the test hub in the web access client for this!